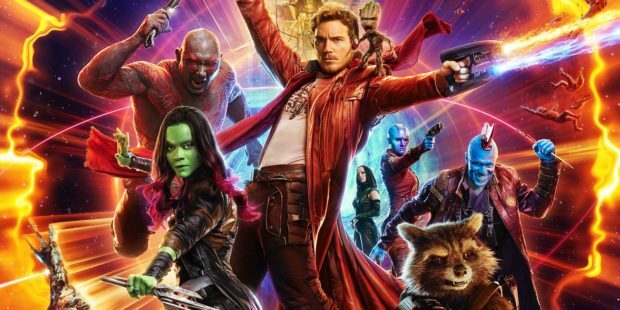 If you loved the insane, glorious over-stuffedness of James Gunn’s Guardians of the Galaxy, the bright, candy-colored sequel delivers all that and more. From that perspective, writer/director Gunn is so steeped in Marvel Comics’ more bizarre corners that the only disappointment is that he hasn’t yet found a place for Obnoxio the Clown — give him time. Guardians of the Galaxy Vol. 2 is fun, with both the strengths and challenges that sequels often have. There’s the temptation to give in to more of what worked the first time around, tempered with the need to move a story forward and develop new character arcs. It doesn’t always find that right balance, but when it does, both fans of the Marvel Movie Universe and the Marvel Comics Universe have to stop with jaws agape — seriously, he did that? Cool. Where the first movie led with Peter Quill (Chris Pratt) trying to spread the legend of Star-Lord, Volume 2 begins with the full team living off their legend. They’ve been hired to protect the invaluable batteries that power the civilization of The Sovereign, a literally golden race led by Ayesha (Elizabeth Debicki). Before Gunn has even gotten to the opening credits, he’s setting up a knock-down drag-out battle with a many-tentacled starbeast, set to ELO’s “Mr. 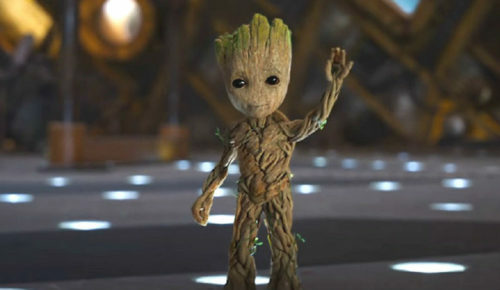 Blue Sky.” Of course, that’s all the better to get what fans really want out of the way — dancing Baby Groot (Vin Diesel), grooving without the flower pot. Everybody’s ratcheted up to what you think you remember about them. Drax (Dave Bautista) has done a 180 from driven avenger to bluntly attacking everything and laughing hard as he does it. 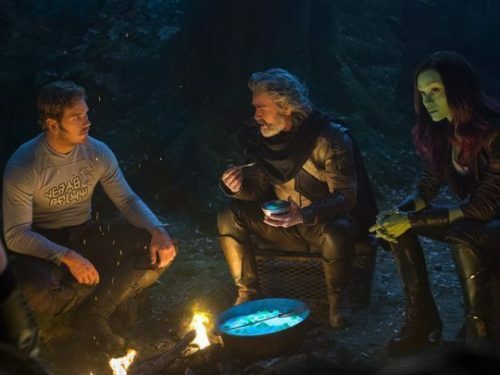 Gamora (Zoe Saldana) remains grimly efficient, with occasional rays of gentleness toward Baby Groot, whose presence literalizes the awkward family dynamic that runs through the movie. Rocket (Bradley Cooper) is more obnoxiously Rocket. And if anything, Quill has gotten a little bit less mature. 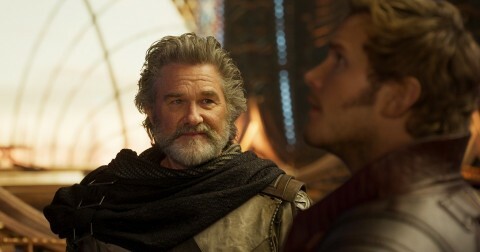 Throwing Nebula (Karen Gillan) into the mix, they squabble, they act like adolescents (except for Groot and Gamora at opposite ends of the spectrum), and then cross paths with Ego (Kurt Russell), Peter’s father and the living embodiment of what Peter thought would be the coolest dad in the universe. To be fair, who could blame him? It’s Kurt Russell, playing Ego with just a hint of Jack Burton, if Jack could actually do all the things he says he could. Following a crucial rule of sequels, the team splits, half with Ego and his companion Mantis (Pom Klementioff), and half running afoul of the Ravagers, now revealed to be a rogue faction led by Yondu (Michael Rooker). Old alliances rearrange themselves, and the movie calms down to actually move forward with its story. Yet it’s also hard not to notice you’ve been here before, that the movie hits a lot of the same beats as the first film, focusing again on Quill’s gnawing parent issues. Granted, the first film set it up, so it’s valid territory. It’s just played a little more bluntly instead of subtextually here. Then again, something has to be done to keep up with the sheer spectacle of the whole thing. There are surprises to be had, with loving visual references to the work of Jack Kirby, Jim Starlin, Mike Ploog, and probably a few others who went wild with Marvel’s cosmic stories in the early 70s. I’m not positive, but the young version of Ego (in the most seamless digital acting yet) bears a suspicious resemblance to another character whose home in the Marvel Universe lies just… beyond. Gunn is remapping the cosmic areas, taking a lot of creative liberty but still with more fidelity than Marvel did with its Ultimate Universe. Since they’re guarding the galaxy, there’s an awful lot to map. Though overstuffed, Gunn does a pretty good job not letting his poking in the corners get in the way of moving forward — there’s a reason that his fabled five post-credit sequences exist. Some lay groundwork without stopping the current movie cold (looking at you, Age of Ultron), and some are just ideas too good to throw away. And still it feels like Gunn had more to show us. With Guardians of the Galaxy, we’re in a giant playroom. The Sovereign’s war fleet are essentially piloted by video game (sounding a lot like Galaga), and for a superior race, they’re certainly petulant children. Here, too, Volume 2 occupies uneasy territory, with an often adolescent tone that means Rocket and Groot aren’t really the kid-friendly characters Disney would love them to be, selling plush toys to decorate your own play room. That play room, by the way, has an old stereo receiver set to Classic Rock, because there’s nothing on the soundtrack you wouldn’t have heard on FM Radio back in the 70s. I don’t know if Star-Lord’s mom was the greatest woman ever, but she sure had taste in music that takes me right back to my 8th grade graduation dance. Guardians of the Galaxy still sits as my favorite of the Marvel franchises, but the inevitable (and anticipated) Volume 3 needs to veer into new and different territory. Knowing how much Gunn knows about Marvel’s cosmos, there’s no doubt he’ll get there.